Provide your indoor salad crops, supermarket living herbs and seedlings with optimum light levels to grow and thrive! Designed to fit propagators, the ROOT!T LED Full Spectrum Grow Light is ideal for growing your favourite plants all year round while taking up very little space. Dimensions - 37 x 24 x 9cm approximately. 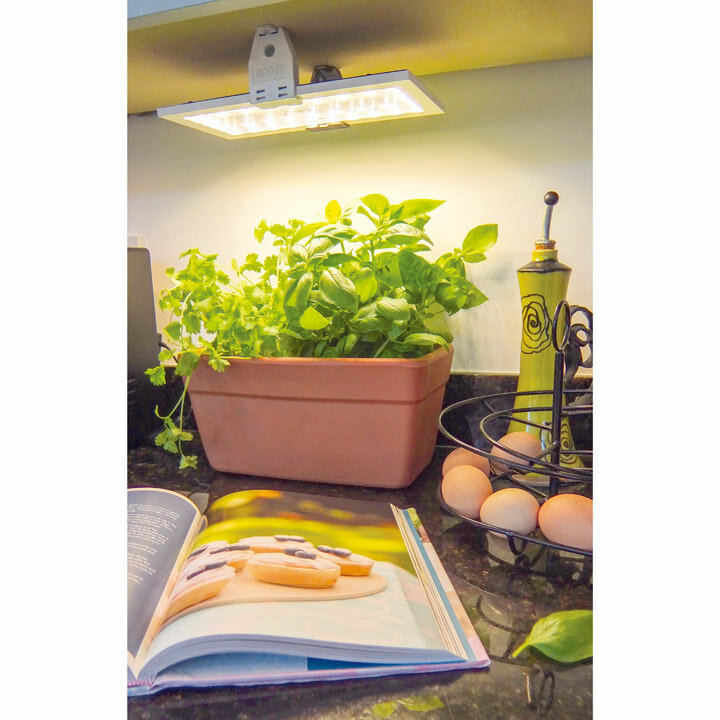 Provide indoor crops with optimum light levels to grow and thrive! This stylish grow light allows you to grow your favourite plants wherever you like, even in areas of low natural light. Simply stick on the rubber feet to sit on top of a propagator for plant propagation or mount under a kitchen cabinet or shelf with the mounting brackets supplied. It provides high light output while maintaining a cool running temperature and low energy consumption. Super-efficient LEDs are used in a patentCho pending design to give you even light coverage and growth. Designed specifically for growing seedlings/cuttings, salad crops, herbs and leafy house plants. It provides high light output while maintaining a cool running temperature and low energy consumption. Choose between low and high power settings depending on availability of natural light. Kit contains: ROOT!T LED fixture with 3000k LED, 2x Deck/Stand mounting clips, 4x mounting clip screws, 4x self-adhesive rubber feet, link cord for daisy-chaining, switchable power lead to driver and main power cord. Ideal for large propagators or growing areas, you are able to daisy-chain two grow lights together with ease using the link cord provided, a maximum of two lights can be run off the same power cord.